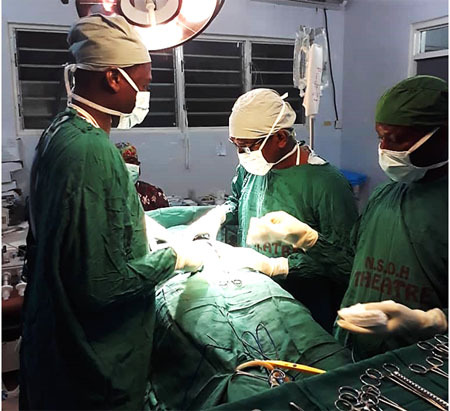 The Society of Obstetricians and Gynaecologists of Ghana (SOGOG) in collaboration with Ernest Chemists Limited, has embarked on a 3-day fistula repair and gynaecological surgical outreach in the Nkwanta District of the Oti Region of Ghana. 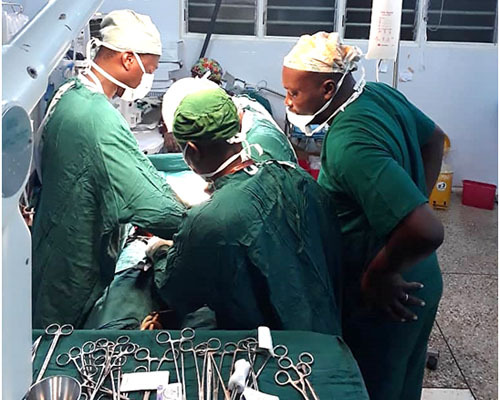 The surgical outreach took place from the 12th to the 14th of April 2019, at the Nkwanta District Hospital. 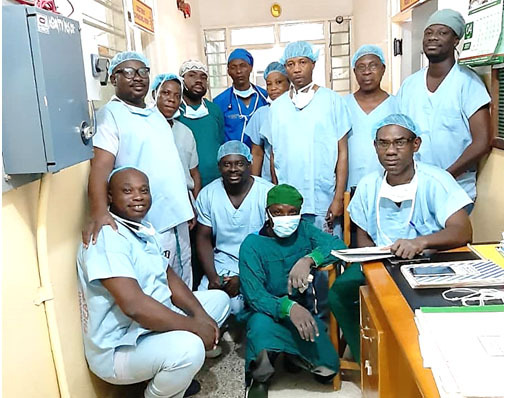 The dedicated team of Specialist and Consultant Obstetrician-Gynaecologists and other medical professionals from Accra, were able to preform a total of 18 major complex surgeries during the outreach, including 6 Myomectomies (surgical removal of uterine fibroids), 5 Total Abdominal Hysterectomies, 4 Vaginal Hysterectomies, 1 Vesico-uterine Fistula (UVF) Repair and 2 Exploratory Laparotomies. With the support of Ernest Chemists Limited, there was a good supply of quality medicines for the surgeries, as well as to enhance the patients’ post-operative recovery. A beneficiary, Madam Vivian Abesie expressed her appreciation to the team of doctors, the Society of Obstetricians and Gynaecologists of Ghana (SOGOG) and Ernest Chemists Limited for organizing the medical outreach and for operating on her. She further asked for God’s blessings for all the organizations that came together to make the medical outreach possible. Dr. Promise Sefogah (Consultant Obstetrician and Gynaecologist), the director of finance for SOGOG and the Chairman of the Outreach Committee, who was part of the team of surgeons had this to say; “We as specialist doctors, are pleased to use our skills to help to reach out to these less-privileged and vulnerable women in the Nkwanta District. Our dedicated team of doctors worked tirelessly throughout the 3-day period to perform as many surgeries as possible”. He narrated the entire experience by adding that “The team arrived in Nkwanta on Friday after 8hours of travel, performed surgeries till around mid-night, then took a break to catch some four hours of sleep. And then we woke up early Saturday morning to continue the surgeries and reviews till the early hours of Sunday, closing around 1am. We finished all the cases booked successfully, had ward rounds to ensure the patients were all recovering satisfactorily and then left Nkwanta Sunday afternoon. We were pleased with the turn out and the success of the surgeries and the outreach as a whole. It’s always been a deeply fulfilling, although tiresome exercise for God and country”. Dr. Sefogah went on to commend the Nkwanta District Hospital Management and Staff especially their Theatre and Anaesthesia Staff for the support for the visiting Specialist Team. He further deeply appreciated Ernest Chemists Limited for collaborating with SOGOG to make the fistula repair and gynaecological surgical outreach a big success. According to the SOGOG Finance Director, the Society has in previous years, funded such outreaches from Membership Dues, purely as their own way of giving back to the poor and vulnerable populations in deprived communities across Ghana. Mr. Yaw Bediako Sampong, the General Manager of Ernest Chemists Limited, emphasized on the commitment of Ernest Chemists Limited to improve health in Ghana. He said “Aside our collaboration with SOGOG, we also partnered the Alexis Miranda Foundation recently as part of World Autism Awareness which is this month of April, to help provide support or Autistic children and their families”. He concluded by adding that, Ernest Chemists Limited looks forward to partner with other organizations to embark on more activities to improve health in Ghana.